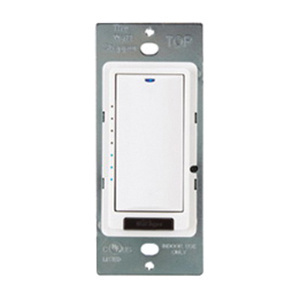 Wattstopper Radiant® 1-Button Digital dimming wall switch has voltage rating of 24-Volt DC and current rating of 5-Milli-Amps. Switch in light almond color, features infrared transceiver for wireless configuration and control. It offers full function dimming control in multi-way applications. This switch has hidden configuration button for easy access. It has two RJ45 ports for network connection. It is suitable for use with DLM dimming room controller. Wall mountable switch measures 1.7-Inch x 1.3-Inch x 4.1-Inch. It is ideal for conference, board rooms, classrooms, training centers and private offices. Switch operates at temperature range of 0 to 55 deg C. Dimming wall switch is UL/cUL listed, RoHS compliant and FCC approved.